Kyle Bogue is a member of Second City's house ensemble Toast and has performed with Second Place Champions, the Unseam’d Shakespeare Company, University of Pittsburgh Repertory Theatre, the Cape & Sword Drama Society, and more. He is a graduate of Second City's Conservatory and iO Chicago and has improvised all over Chicago and Pittsburgh. He works at a mystical fairyland called Jellyvision and wants to meet your whole family. Alyssa Davis is a Chicago-based actress and comedian. She majored in Theatre at University of Richmond, was a member of the improv team 'Subject to Change' and started UR’s first sketch video group, Sub Par Productions. She worked with an Emmy-Award Winning Filmmaker in a Documentary about the Dah Theatar in Serbia. She is on the independent teams The Spotty Truth and Garbage People and the Harold team Emergency Sleepover. She provides improv-based corporate workshops with Improve it and has studied at iO, Second City, and Annoyance. 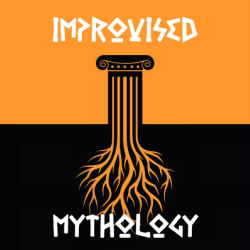 Nick DiMaso identifies with monsters, which is why he's so happy to be playing with Improvised Mythology. Nick co-wrote a full length play called Bucky D's, directed a sketch comedy group Mee-Ow, and made some films at Northwestern. He can also be seen performing at iO with the Harold team Webcam, and his one-man show, Superhero, will be premiering at the Chicago Fringe Festival this September. Nick's spirit animal is a golden retriever. Matt Fox is the creator of Improvised Mythology and an ensemble member of Under The Gun Theater. He's also a graduate of the training programs at The Second City and iO, and graduated from DePaul University with B.A. in Screenwriting. In his spare time, he enjoys all things geeky, from trivia to comic books. Leila hails from Charleston, SC and graduated from Indiana University with a BA in Theatre and Drama. Leila has trained through The Second City Conservatory and iO Training Center. When she isn't performing with Improvised Mythology, you can find her performing around the city with her independent team Alterboyz! One of Leila's favorite Greek Gods is Hephaestus because he is described as the "lamest god." Tim Lee is an actor and improviser who has been in Chicago for seven years. 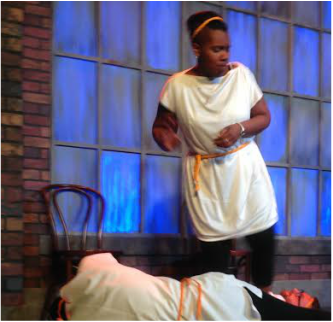 After studying theatre at Evangel University, he toured and performed as a part of the Skinny Improv. He is a graduate of the iO training program, an Associate Member of Strangeloop Theatre, and part of Under the Gun Theatre’s ensemble. He is always looking for opportunities to do what he loves with wonderful people. Will Meinen is a Chicago-based improviser, writer, and storyteller. Will has trained at iO, Annoyance, and Second City theaters. He currently performs with the Harold team Big Spoon at the iO Theater and is an ensemble member for the Under the Gun Theater. Matt Pina is an ensemble member at Improv Boston and Under The Gun Theater, as well as a graduate of The Second City’s Comedy Studies and Conservatory programs, and iO’s improv program. During his time at Under The Gun, he's helped create shows including Sketch-Time Continuum and Space Warps. When he's not writing or performing, Matt teaches people how to fly planes. It's pretty cool. Matt would also like to thank his family, particularly his mom, Lynne, and dad, David, for their everlasting moral, loving and sadly financial support. Becky Regalado was born and raised in the cornfields of Indiana. She received her BA in Communication Studies at Saint Mary’s College and her MBA from Purdue University North Central. She has completed iO’s training program as well as the Second City Conservatory program. 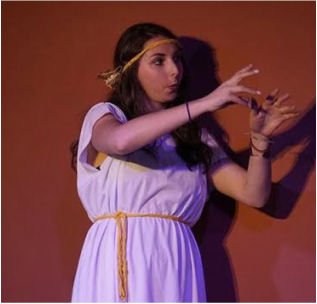 Becky is extremely grateful and amazed to be playing alongside the talented mythmakers of Improvised Mythology. If you know Jon Hamm, please contact her. Seriously. Vince is a tall child with two credit cards and a lease. In 2013, he moved from Michigan to Chicago where he has studied improvisation at iO and the Second City in the Conservatory Program. Being a part of Improvised Mythology is one of the highlights of his life, and he is thrilled to inform the masses about the true origins of nature with some of his best friends. Vince loves bits, orange and yellow starbursts and his mom (not in that order) and wishes Alyssa Davis a Happy Recorder Month. 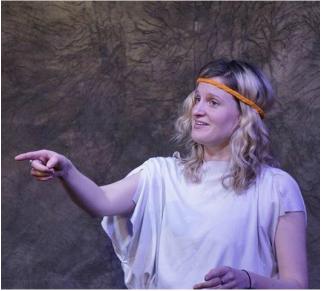 Alex Wiseman loves playing with her babies from Improvised Mythology. She graduated from Ball State University and has also studied at Second City, Annoyance, and iO. Alex is a member of the Under The Gun Ensemble. She would like to thank her amazing family and friends for supporting her dumb ideas. Laurel is a Chicago-based writer, director, improviser, and storyteller who drives a 1994 Buick Century. A Minnesota native and graduate of Northwestern University, she has studied in the Second City Conservatory, and completed the iO Chicago Training Center and Musical Improvisation programs. She is also a writer, director, and teacher at Mudlark Children's Theater. You can find Laurel performing with her iO Harold team Comet, with her musical improv crew Bombshell, telling stories around the city, and driving in her super cool 1994 Buick Century. She is so proud to be an ensemble member at Under The Gun. Ric is a performer, teacher, writer and director. As an improviser, Ric has had the pleasure of working with some of the nation's best improv companies including MCTD (Midwest Comedy Tool & Die), Comedy Sportz (Chicago) and currently performs with The Improvised Shakespeare Company in Chicago. He has performed extensively for the world famous Second City and is currently a Professor in the Comedy Writing and Performance department at Columbia College. Ric has recently been published in a compendium of short stories entitled Briefly Knocked Unconscious By A Low-Flying Duck.